With the upgrading of the internet, social media marketing is born which is gradually replacing traditional marketing. Social media marketing, or traditional marketing, which one is better, has always been the heated discussion all around. As it says for itself, traditional marketing is promoting and selling products or services in the real world. Mediums of traditional marketing includes: radio ads, Television ads, newspaper and magazine ads, and print advertising – like pamphlets, billboards, catalogs and sales materials. Traditional marketing is the most noticeable types of marketing, which we see and hear every day. Whereas, Social media marketing is the latest method for buying and selling online. It refers to the process of attaining traffic or attracting customers through social media sites. Following are the mostly used social media channels – Facebook, Instagram, Twitter, Pinterest, Google+, Linkedin, YouTube etc. Social media marketing also helps to resolve the problems that traditional advertising has and that is why it’s growing with each passing day. Hence, social media marketing is being favored over the traditional marketing. Read more to find which would be appropriate for you. 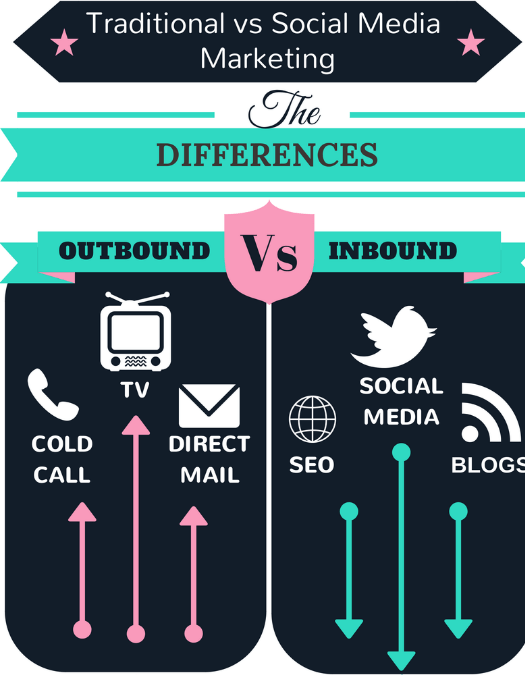 Here’s a quick comparison between the two types of marketing, since traditional marketing is fixed which means we cannot change anything about it once published, social media marketing is instant, easy and continuously updateable. Traditional marketing has small ”committee” of publishers and in social media marketing, every person becomes a publisher. Sharing of published media is not encouraged in traditional marketing, whereas its encouraged in social media marketing. Social media marketing is often free while traditional marketing is expensive. Wider reach : The best advantage of traditional marketing is anyone with a newspaper, mail service, television or radio can learn of your business or service, instead of going online. Real world communication : Traditional marketing provides you with real world communication, which means people can touch, feel, hear and interact with this form of marketing. It’s forced on you: Traditional marketing is often seems to be forced on the viewer or receiver, as they come across it in their daily lives, which means it has a low response rate. For example, we usually ignore the ads on television or people passing us pamphlets etc. Lack of community: Advertisers usually spend heaps of money on promotions trying to reach people. But most of the audience don’t really care enough about their product as they don’t find something common with the brand. As a result, it turns out to be useless. Very High Conversion Ratios: When it comes to social media marketing, more the people liking and responding your online promotions, means more money. As Social media marketing can be tailored according to the taste of the audience, more and more people respond to it and the return on your investment is extremely large as compared to traditional marketing. Community building: In today’s time another way of increasing your income is through repeat sales. Social media marketing helps to build communities around the brands, which strikingly increases the repeat sales. The moment your brand becomes more popular, more people will be attracted to it which in turn will bring more money. Dependent: This is the major drawback of social media marketing, it relies on customers being active on the internet. If a customer does not use the internet often, or not at all, you lose them as a client. Same difficulty can be faced if your company lost the internet connection even for a while, you can lose a huge amount of money. Scam: There have been number of cases of scam as we can’t really guarantee that the identity of the person we buy the product from, and nothing can be done afterwards. Therefore, its recommended to buy things from an already trusted vendor. Well, after going through all the above mentioned points, its better to use social media marketing with a bit of a touch from traditional marketing. It will be easy to attract customers to your products through social media marketing and along with that you can also provide a real world service to come up as a more reliable vendor. Online operations will surely get more customers, but it wont be long before another online vendor, most probably your competitor will come up with something similar to your online strategy, may be with a bit of added perks, and you’ll lose your online customer base. Hence, here you can take the advantage of the mixed strategy, by having local customers, which will mostly keep loyal to you.